Day 2 begins with an airboat ride through the dense forests of the Henderson Swamp. After their ride, Scouts will paddle to the spillway levee, a man-made structure that lines the east and west sides of the swamp and protects adjacent communities from flood waters. The first portage of the trek takes Scouts up and over the 25’ high levee into Bayou Berard, a wide waterway that leads to the small fishing community of Catahoula, LA. Note: This portage, though only 900 feet long, is not easy. It takes place at 12:00pm when temperatures are 90 degrees or hotter. Physical conditioning prior to arriving is highly recommended. During their second night in the Atchafalaya, Scouts will sleep on primitive Rougarou Island, with no running water or electricity. 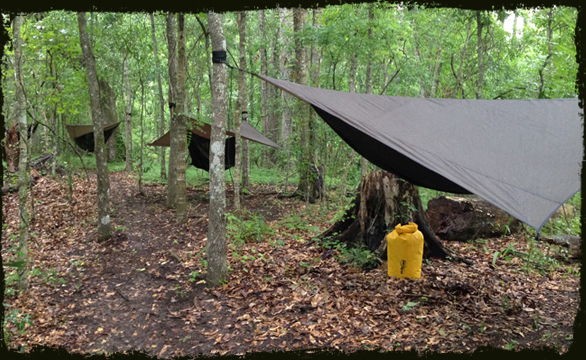 The evening’s accommodations are Hennessey hammocks strung between the trees. It is thought that a Rougarou, or Cajun werewolf, prowls the surrounding swamps. Be on the lookout!! !